My friend Annie planted fennel in her garden this year with hopes of attracting Eastern Black Swallowtails to lay their eggs there. Fennel is one of their many host plants (things that their caterpillars can eat when they hatch), along with carrots, celery, parsley, dill and others. And sure enough, she got a bumper crop of swallowtail caterpillars on her fennel, and offered to let me take some of them to raise. I was hesitant at first because I had my hands full with monarchs and a few new moth species, but eventually I couldn’t resist any longer and accepted four of them in various stages of growth. Here’s one of the smaller ones, with its white saddle of uric acid deposits that are thought to help protect them from harmful chemicals in the diet. You can see the shed skin behind this one; he’ll turn around and eat that skin. Yum. So we were off and running on this new adventure. I kept them supplied with celery, parsley, and dill, and they continued the work of eating, pooping, and molting. Caterpillars generate a lot of frass (poo) as they get larger, and it’s a challenge to do the daily cleanings of their container without disturbing them too much, but I make my best effort. 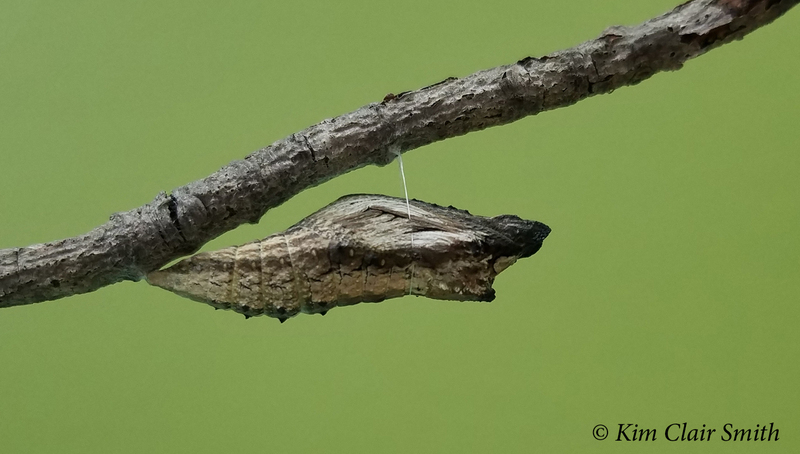 Finally, on September 10, one of them crawled up on a stick I’d provided and assumed the pre-pupa posture, hanging below the stick. I got excited and kept checking it throughout the day, but nothing happened other than a slight scrunching up, like a Slinky toy being pressed together. In case you’re wondering, he didn’t change positions on the stick; I just took some of the photos from the other side. I thought this stage was beautiful, with the subtle greens and browns, and the varying surface textures of the chrysalis. And then the next day the chrysalis was in its final form, with gorgeous brown and white marbling. 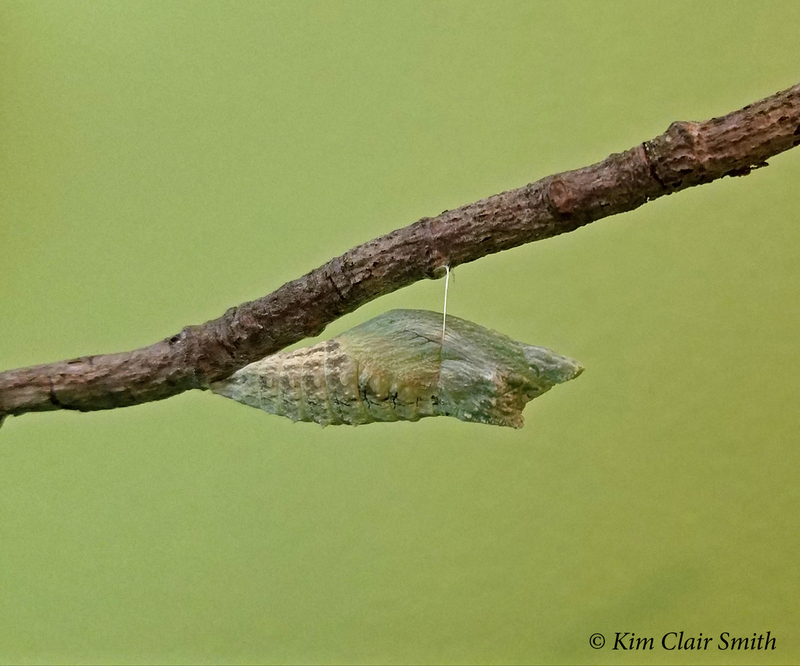 The black swallowtail chrysalis can be green or brown, and all four of mine are brown like this one. I’ve read some suggestions that the color is determined by the surroundings, perhaps to blend in with foliage or something. But these guys were in a room with green walls, and they made brown chrysalises, so that theory doesn’t hold water in this case. Or I suppose it would be more likely that he’s brown because the stick is brown, in which case the theory holds. Ah, so many questions! And now comes the big mystery: Will these guys emerge in a couple weeks, or will they stay in their chrysalises all winter long? I haven’t found any information that would tell me how to know what to expect, so my plan is to watch them closely for the next couple of weeks. I would love to see them emerge so I can release them before the weather gets too cold. But if they turn out to be the overwintering types, I’ll put them outside in a semi-sheltered spot and wait for the “big reveal” next spring. Either way, I’m looking forward to watching this amazing process unfold. I was just talking to a friend today about the process of metamorphosis. It’s something we all learn as children. We grow up knowing that caterpillars turn into butterflies, but I’d guess that most of us don’t really and truly think about it too much. I know I never appreciated what an incredible thing it is, until I became intimately involved in their lives as I shared my home with them. Since I’ve been raising butterflies over the past few years, I’ve had days where I just sit and watch them in utter amazement as I think about their lives. A butterfly lays a microscopic egg on a plant. The miniscule caterpillar hatches and begins feeding on the leaves. If she lives long enough, there comes a day when she turns into an unrecognizable mass of goo that hardens into a beautiful shell-like structure. Then, inside that structure her body somehow liquifies and gets reassembled into an animal with big, soft wings. My mind can’t even comprehend it, really, but it brings me so much joy every single time I see it happen. I don’t like to use the word “miracle,” but sometimes I feel like that’s the word I need to describe a butterfly’s metamorphosis. This entry was posted in Insects and tagged butterfly, chrysalis, Eastern Black Swallowtail, lepidoptera, metamorphosis, transformation. Bookmark the permalink. Being a tutor, I am keeping this post for my students. Its a perfect educational tool Kim! So glad it’ll be useful, Marian! I love this post! I plant nature-friendly plants for as many forms of life as I can. What a beautiful process you get to witness by taking it a step further! Thanks for sharing so much about this amazing transformation, Kim! Thanks, Tim! Glad you liked it.